Low pressure washing is safe and versatile. As the name suggests, water is applied at a relatively low pressure, which avoids damaging the surface. This makes it safe to use on walls, roofs, windows, decks, paths, driveways or fences. This gentler approach achieves great results too, capable of restoring the life and lustre of paint or wood back to its original state. Adding to this, our low pressure cleaning system not only cleans, but sterilises. Once applied, future growth of mould, algae and moss will be prevented, saving a lot more maintenance in the long term. The sterilisation factor also means that you and your family will be breathing the cleanest, purest air around your home. The Chemwash Low Pressure Cleaning system saves a whole lot of time as well, done in just two simple steps. The cleaning process begins with the application of our detergents, followed by a low pressure rinse. The water is applied at around 600-1000psi using fan spray nozzles. This uses a lot less water and prevents the surface from being damaged. 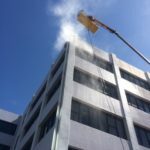 Water blasting is a much more aggressive approach to cleaning, so there is naturally more risk involved. This more forceful approach to cleaning makes it useful for removing tough exterior stains. Experience is is recommended however, as without it there is a high chance you could damage your home or even cause injury. High pressure and a narrow spray allows the water to cut through dirt and other substances with more ease. Because of this however, it typically requires a certain level of discipline and technique to avoid undesirable results. Most water blasters operate at a pressure of around 2000-5000psi, sometimes even higher. This means that water blasting will often remove a thin layer of the surface material along with the dirt and grime. Unlike low pressure washing therefore, it is not recommended for use on all surfaces. For example, water blasting can actually strip away paint or even break windows if applied in the wrong areas. To learn more about what low pressure cleaning can do for you, check out our services or request a quote for a free personalised assessment. "Please pass on my thanks for the fast and efficient delivery, house looks fantastic."